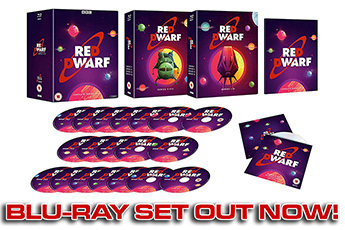 The full-series revival drew from Red Dwarf's past while building for a new future. 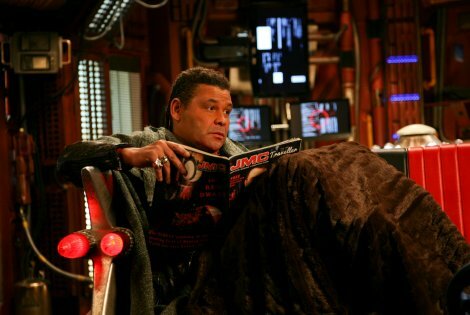 reddwarf.co.uk looks back at Series X. Originally intended as an anniversary celebration, 2009's Back to Earth was clearly driven by the urge to celebrate the show's past - drawing in elements from every one of Red Dwarf's diverse previous eras. 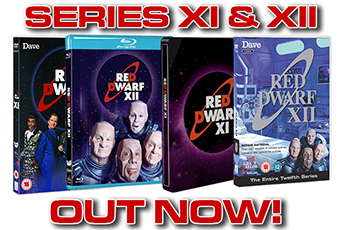 With Red Dwarf X, however, the remit was different. This was a new series, the first time such a thing had been made since the late 1990s - and as such, the show needed to lay the groundwork for a possible future at the same time as honouring everything that had gone before it. The result, then, was a more compelling mixture of old and new than had been seen before - and the sense of everything simultaneously feeling familiar and yet given a new twist extended to more than just the sets and costumes. On the one hand, the stories and settings were new - but the themes were very much in line with Red Dwarf's original ethos, and drew heavily on the characters' backgrounds and family histories. 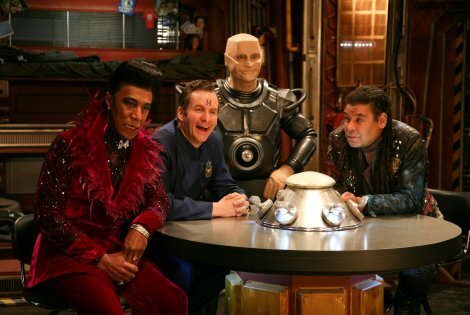 Nowhere is this more evident than in the opening pair of episodes, which take it in turns to explore the family backgrounds of first Rimmer and then Lister (although the strength of Fathers and Suns both at script level and after taping was such that the episode was considered a candidate for being swapped into the series opener slot). Finally getting to meet one of Rimmer's fabled brothers - beyond a brief cameo by Chris Barrie himself as Frank all the way back in Timeslides - is undercut in typically Red Dwarf fashion by the revelation that Howard was every bit as much a coward as Arnold. It's a revelation, though, that raises more questions than it answers. We've always assumed that Arnold was the least favourite of the Rimmer boys precisely because his cowardice and weakness set him apart. But if at least one of his brothers is actually more like him than we thought, is the same true of John and Frank as well? Are all their tales of success lies? Or - worse - do Rimmer's parents give them all a free pass while doling out harsh treatment to Arnold? 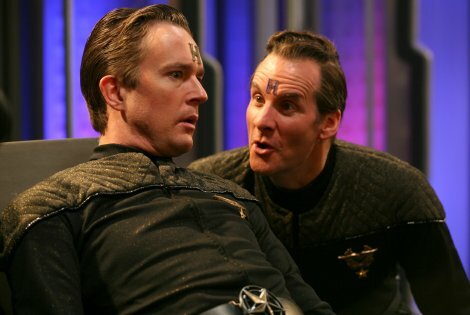 Either way, the opportunity for our Rimmer to finally share some kinship with one of his brothers is passed up in favour of his desire to get one over on Howard at last. In The Beginning, of course, we're given an even more jaw-dropping piece of new information - yet it's one that causes, in Lister's words, "a million-piece jigsaw to fall into place". If Arnold is the result of a fling with the gardener rather than being the son of his "father", then it perhaps explains why the Rimmers are so dismissive of him. It doesn't justify it in the slightest, of course, but it makes it slightly less irrational. Of course, coupled with the earlier discovery about Howard, the idea that Rimmer is only useless because he's the son of Dungo is given short shrift - but then, having learned that Rimmer Senior is such a weak-minded and petty man himself, perhaps his genes aren't all he believes them to be anyway. Issues of fatherhood also crop up for Lister in not one but two episodes. In Fathers and Suns, a conceit that was always one of Doug Naylor's most distinctive sci-fi ideas - that of Dave being his own father - is explored for a second time. But where in Ourobouros this was used for the emotional impact of showing Lister as the person who keeps the human race alive in a constant cycle, here it's mined for more in the way of humour and clever narrative looping. In Dear Dave, meanwhile, the possibility of another son - this time one that isn't himself, and one that he never got the chance to know - causes him to re-evaluate what kind of a legacy he might have left. This is one of several occasions on which Series X makes us acutely aware that Lister is once again the only living human around. An overriding feeling of aching loneliness persists, and with only two episodes that see the characters set foot on something that isn't a spaceship, everything is that little bit more claustrophobic, calling to mind the very first series - in which the gang were rattling about on an empty, echoing ship, with assorted threats coming as much from within as without. That's not to say the crew don't encounter new characters and ideas, of course. In Entangled we're given several hints of a universe that remains more populated than it seemed back in those early "three million years later" days - a new type of GELF to meet, as well as the thought that there could be other people out there who, like Lister and Irene Edgington alike, have spent countless millennia in suspended animation, just waiting to be woken up. Just like the BEGGs are a new variation on the GELF theme, so too do other characters remind us of classic Red Dwarf ideas while putting a fresh spin on them. Pree could almost be a new Holly were it not for her unfortunate habit of rendering the crew entirely obsolete; the Medi-Bot turns the notion of the ship's automated vending machines, toilets and toasters up to eleven; and the new Simulants feel like the purest distillation yet of the unmitigated evil that has characterised their recurring appearances. And then there's Hogey the Roguey. It's not just the idea of a deranged but ultimately harmless rogue droid turning up to occupy that strange space between sort-of friend and annoying pest that works so well - it's the implication that it's been going on for a while. With such a long in-universe gap between stories (notwithstanding the diversion for Back to Earth), there's a wealth of potential adventures to be filled in - and Hogey's rapport with the crew may only be a small part of that, but it at least suggests to us that in the time offscreen they've been doing more than sitting around waiting for us to join them again. If there's an odd episode out in the series, it's Lemons. Structured differently from the others - it's the only ep not to feature a subplot, with all four characters instead involved in the main story - it's also the most overtly comic. It's not the first time the show would throw the characters randomly back in time to interact with an historical figure, but rather than concentrating heavily on the time-bending implications of their actions, it's simply an excuse for a relentlessly fun romp with the character himself. The episode allows Doug to again make comments about some of the problematic aspects of organised religion, while taking care not to directly insult the figures of worship themselves. It's a difficult line to walk, but the revelation over Jesus' full name - and the fact that when the actual Jesus turns up at the end he's treated respectfully - allows the show to negotiate it deftly. What could have been a controversial and troublesome episode instead ended up becoming arguably the series' best-received. 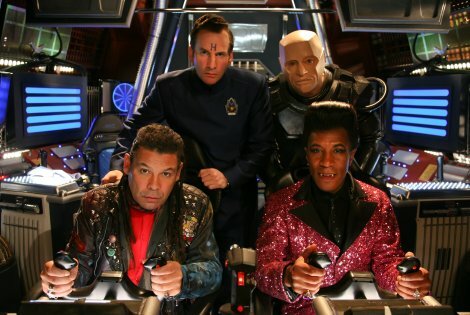 In the end, though, after spending so much time looking to the characters' past, Red Dwarf X raises its gaze to the future. And after having shown us our heroes filled with loneliness and despair, it ends on one of the most hopeful notes we've ever seen. Both Rimmer and Lister have renewed purpose - the former finally feeling like he has a father that would be proud of him, and the latter realising (or, drunkenly telling himself in a video) that his situation will only improve if he takes charge of his life. There's a new unity to the group, too, with all four characters playing a significant role in rescuing the ship and themselves from their attackers. The close of Series X finds the show at a curious junction. 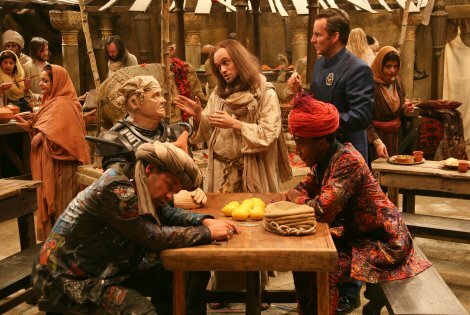 In slightly bet-hedging fashion, the season resolves itself neatly, contrasting with several previous series by not ending on a cliffhanger and instead giving us a conclusion that, if it were the last Red Dwarf moment ever committed to film, would be completely emotionally satisfying. 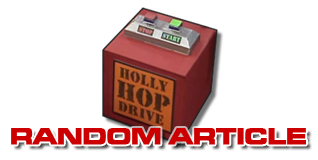 Yet and at the same time, if RDX achieved anything, it was showing that twenty-first-century Red Dwarf is an entirely viable proposition. Revitalised, revamped - and still relevant - the series that ended with an episode titled The Beginning felt like exactly that. A new beginning.